**Dull, limp and dry hair. With shampoo & conditioner system vs non-conditioning shampoo. 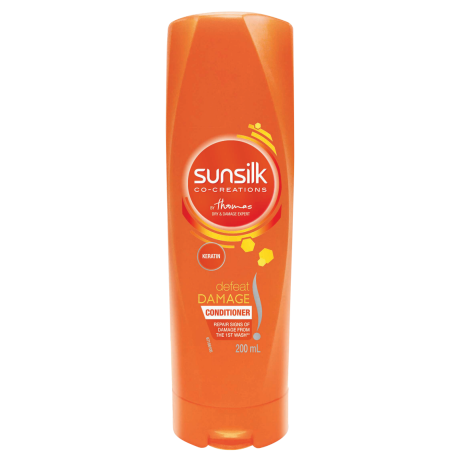 Sunsilk Defeat Damage Conditioner 200ml Repair signs of damage from the 1st wash** **Dull, limp and dry hair. With shampoo & conditioner system vs non-conditioning shampoo. Ready? Massage onto wet hair and then rinse thoroughly. Repeat application and use daily. For even more incredible hair, why not combine it with Sunsilk Defeat Damage shampoo? Water, Cetearyl Alcohol, Dimethicone, Stearamidopropyl Dimethylamine, Behentrimonium Chloride, Helianthus Annuus (Sunflower) Seed Oil, Hydrolysed Keratin, Calcium Glycerophosphate, D-Glucanolactone, Trehalose, Sodium Sulfate, Amodimethicone, Peg-7 Propylheptyl Ether, Cetrimonium Chloride, Cyclotetrasiloxane, Dipropylene Glycol, Lactic Acid, Sodium Chloride, Disodium Edta, Methylchloroisothiazolinone, Methylisothiazolinone, Phenoxyethanol, Fragrance. I have used this conditioner and shampoo for nearly 20 years. My hair is very long and is constantly in the sun and surf. This conditioner keeps it glossy, de-tangled and so soft. Literally like silk. Always comments about my beautiful hair.